Note: Though it has been awhile since my last entry I have been out on the water. This weekend is the Southwest Kayak Symposium. It is a weekend of talks, practical classes, and equipment tryouts all centering on the pass-time or sport of Kayaking. I have enrolled in the Kayak Foundation Skills class. And I planned to go to one of the Tent Talks, free talks covering subjects related to kayaking. The site of the Symposium is at Campland By The Bay on Mission Bay. Friday night was opening night dinner and presentation. 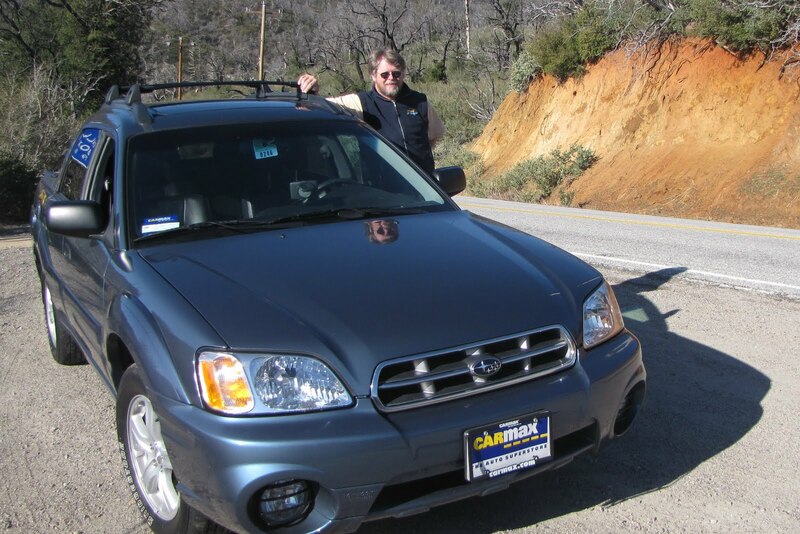 I drove my "new" Subaru Baja Dive/Kayak mobile. I am still using my old Ford to store my ocean going stuff. I am keeping this one clean for a few months. Valley Wide Kayak Club and San Diego Kayak Club provided a light meal and Aqua Adventures provided the beer. A guy did a slide show on a kayak trip he did in Newfoundland. And then Jake, the guest of Honor, presented his slide show of his Portage to Portage kayak trip. He left off in Florida to come to the Symposium. Both had great stories of their adventures. Saturday morning promised to be a beautiful day. I arrived at Campland about 9:00 am and paid my "Day Use" fee. Then I drove to the beach and unloaded my kayak . I marked it with the "private – do not use" tag that was provided in my registration packet. This lets people know that this kayak is not a rental for use in classes. I parked my car and went back to the beach to find where my Foundation Skills class would meet. I found it at listened in for a bit on the Foundation Skills class prior to mine. At 10:00 I went over for a Tent Talk about what to wear while Kayaking, It is always important to look good whenever you are undertaking a new activity. Actually the talk was about what to wear in different kinds of weather conditions. For San Diego, it is quite appropriate to wear light clothing in the summer as long as you are protected from the sun, hat, long sleeve shirt, or if sufficient Sunscreen. Weather can change quickly, and the wind usually picks up in the afternoon. So a wind-breaker might be useful. In colder weather a wetsuit may be needed. I typically wear a shorty Farmer John for just kayaking. This leaves my arms free to paddle. And when I am going on a kayak dive I have a full Farmer John wetsuit with a separate top that I can get in once out at the dive site. Dry Suits for very cold water were discussed. Turns out, there are differences between kayak dry suits and diving dry suits. Kayaking dry suits may be made of a material that allows perspiration to evaporate. Layering is another important consideration for kayaking. Different warm clothing and wind protective garments were discussed. Something that dries quickly and provides UV protection is good for sunny days but when you are going to get wet. If you have a material that stays wet you may suffer hypothermia. Just before noon I set up my kayak and moved it to the beach in front of the class area. I met with the instructor. This class was a little smaller than the first class. That was good because it meant more personalized instruction. Damon was my instructor. That is him in the second position in this Modular Kayak. Pieces can be added or subtracted depending on how many people you wish to seat. People were set up in their kayaks and we headed out on the Bay. Damon also had an assistant , Lisa marie, along to help. Here she is teaching us the Sweep Stroke. I have been kayaking for over two years now. This is the first formal training I have undertaken. We were taught the Forward Stroke, the Sweep stroke for turning, and two strokes for moving your kayak sideways. The forward stroke I knew. But I was made aware of some bad habits I have picked up. Before learning the next stroke Damon had us paddle at an angle to the wind. He asked how our kayaks handled. They would turn into the wind. He pointed out the the kayak wants to take the path of least resistance and so heads into the wind. I probably was aware of this on a subconscious level but had never considered it. I would just react and turn my kayak back to the desired heading. I probably would do a couple of extra strokes on the windward side of my kayak to compensate. And this would interrupt my rhythm. The Sweep stroke and its uses were new to me. Now I can work on combining it with the Forward stroke to maneuver my kayak without having to interrupt my paddling rhythm. So, all in all, a productive class with some cool instructors. Damon is a diver and does occasionally kayak dive. Maybe I will get out on the Ocean with him sometime. After stowing my kayak and all my gear I went for a bitet to eat. My favorite place, The Bare Back Bar & Grill ( a New Zealander Pub), was packed and I could not find a parking spot. So I went to my old stand-by, The Australian Pub on Cass and Grand. Came back to Campland for the Raffle. A couple of tickets were included in your entry fee. I had some money left over from dinner and bought four more. I took home a couple of good prizes. I enjoyed myself and learned a lot. Now to get out on the water and practice the skills and lose all those inefficient paddling habits.